Modern critical scholars divide the Pentateuch into distinct components, identifying areas of unevenness in the scriptural tradition, which point to several interwoven documents rather than one immaculate whole. While the conclusions reached by such critical scholarship are still matters of dispute, the inconsistencies which it has identified stand clearly before us and pose a serious challenge to the believer in divine revelation. How can a text marred by contradiction be the legacy of Sinai? How can there be reverence for holy scriptures that show signs of human intervention? 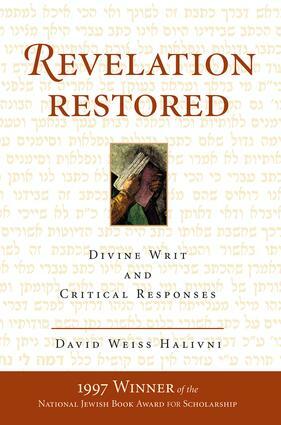 David Weiss Halivni explores these questions, not by disputing the evidence itself or by defending the absolute integrity of the Pentateuchal words at all costs, but rather by accepting the inconsistencies of the text as such and asking how this text might yet be a divine legacy.Inconsistencies and unevenness in the Pentateuchal scriptures are not the discovery of modern textual science alone. Halivni demonstrates that the earliest stewards of the Torah, including some of those represented in the Bible itself, were aware of discrepancies within the tradition. From the Book of Chronicles through the commentaries of the Rabbis, sensitive readers have perceived maculations, which mitigate against the notion of an unblemished, divine document, and have responded to these maculations in different ways.Revelation Restored asserts that acknowledging and accounting for human intervention in the Pentateuchal text is not alien to the Biblical or Rabbinic tradition and need not belie the tradition of revelation. Moreover, it argues that through recognizing textual problems in the scriptures, as well as efforts to resolve them in tradition, we may learn not only about the nature of the Pentateuch itself but also about the ongoing relationship between its people and its source.